Children suffer postoperative pain in the same way as adults. Pediatric pain management is a challenge. Patient-controlled analgesia (PCA) is a flexible, reliable, and individualized method in postoperative pain therapy. However, young children are not able to use PCA themselves, and hence they need to receive PCA by proxy (parent or nurse). The guidelines for PCA by proxy in pediatrics are still insufficient. The aim of this study was to determine the safety and efficacy of PCA by proxy after major pediatric cancer surgery. We studied 330 pediatric cancer patients between 1 and 10 years of age scheduled for major surgery. They were divided into three equal groups: group C (child PCA), group P (parent proxy), and group N (nurse proxy). In each group we measured vital signs, pain intensity, total morphine consumption, side effects, and specific PCA monitoring for the first 72 h postoperatively. 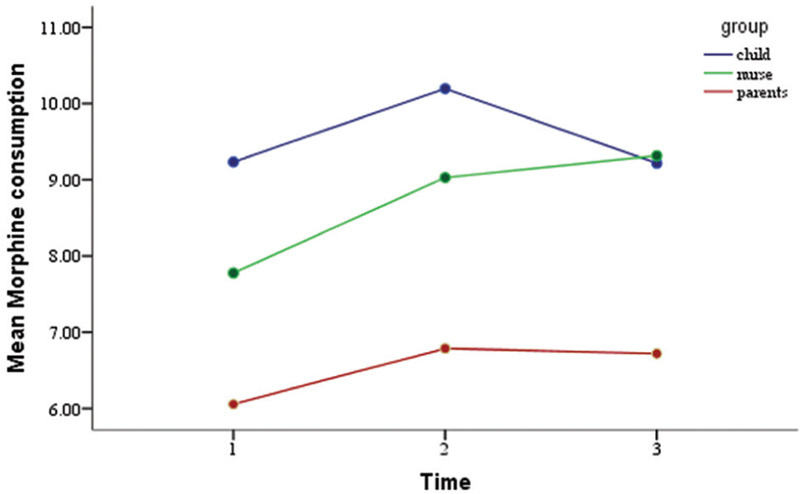 We found that pain scores were higher in the nurse group compared with the other two groups on days 2 and 3 (P < 0.001); morphine consumption was higher in the child group (older age). Vital signs were comparable between groups. There were no significant differences in sedation scale, and there were limited complications with no difference between groups. Parent-controlled PCA is a safe and effective method of analgesia for children between 1 and 6 years of age. Nurse-controlled proxy is safe but not effective in controlling child pain. Child-controlled analgesia is safe and effective in children above 6 years of age. Pain management in children presents additional challenges than that in adults . The practice of pediatric pain management has recently made great progress with the development of pediatric pain assessment tools . The guidelines provided by the American Pain Society and the Joint Commission on Accreditation of Healthcare Organizations provide evidence-based pediatric pain management guidelines for different ages . A multimodal approach is preferred to treat pain in children (analgesics, local and regional analgesia, with opioids when indicated) to minimize side effects of individual drugs or techniques . Pain control is crucial to avoid serious adverse effect of untreated pain . Patient-controlled analgesia (PCA) has become widely accepted as a convenient, safe, and effective modality for pain control . Infants and young children are not able to operate PCA independently, and hence parent-controlled or nurse-controlled analgesia is an option for these children . PCA by proxy describes activation of the PCA device by someone other than the patient . This technique is controversial because of concerns as regards the risk for overdosage and the potential for respiratory depression. The use of demand dosing technology in young children is limited by a lack of evidence of its efficacy and safety . The aim of this study was to determine the safety and efficacy of PCA by proxy in pediatric patients in comparison with the standard PCA using morphine. We studied 330 patients who had undergone major thoracic, orthopedic, and pelviabdominal cancer surgery in the National Cancer Institute and Children Cancer Hospital (57 357), Cairo, from July 2012 to July 2014. Inclusion criteria were as follows: age 1–10 years and children whose parents can deal with the PCA. Exclusion criteria included morphine allergy, airway compromise for any reason, and impaired renal functions. After obtaining institutional ethical approval and written informed consent from parent of each patient, 110 older patients were included in child (patient)-controlled analgesia (group C), and the remaining 220 patients were randomly divided using the sealed opaque envelopes method into nurse proxy-controlled analgesia (group N) and parent proxy-controlled analgesia (group P). Preoperative assessment was carried out, during which the suitable group for each patient was chosen, PCA was fully explained, and written consent was taken. In PCA, we used morphine sulfate with a background dose of 0.01 mg/kg/h for 72 h with a bolus dose of 0.1 mg/kg and lockout interval 20 min with programming of a 4-h maximum dose limit of 0.4 mg/kg . The PCA pump used was a Master PCA (Fresenius Kabi vial; Le Grand Chemin, Brezins, France). Vital signs (blood pressure, heart rate, oxygen saturation, and respiratory rate) were measured and recorded every 4 h. Continuous pulse oximetry was used during the first 4 h of PCA and whenever background or bolus doses were increased . Pain intensity was assessed and recorded every 4 h. For preverbal children (1–6 years), pain was measured using the FLACC scale, which incorporates five categories of behaviors (Face, Legs, Activity, Cry, and Consolability), each of which is scored from 0 to 2 with total scores ranging from 0 to 10 ([Table 1]). Sedation was measured using the University of Michigan Sedation Scale ([Table 2]) every 2 h during the first 24 h and then every 4 h.
The patients were assessed for complications, including nausea and/or vomiting, respiratory depression (respiratory rate≤8 breaths/min, SaO2≤90%), and itching. Specific PCA monitoring included total number of trials, number of successful trials, and total daily morphine. To show a difference of hypothesized 20% response in PCA by patient or proxy with an a-value of 0.05 and power 90%, we needed at least 110 patients per group to compare the patient-controlled group with the parent-controlled and nurse-controlled groups. Data were analyzed using SPSS Statistical Package for Social Sciences, Inc., (statistical package version 17, Chicago, III., USA). Numerical data were summarized as means and SD or medians and range, as appropriate. Qualitative data were described as frequencies and percentage. Comparison between two groups for numerical variables was made using Student's t-test or Mann–Whitney U-test (nonparametric t-test), as appropriate. Comparison between more than two groups for numerical variables was made using analysis of variance or nonparametric Kruskal–Wallis, as appropriate. For qualitative data, we used the χ2-test or the nonparametric Fisher's exact test, as appropriate. Demographic data are shown in [Table 3]. The significant age difference is accepted being the classifier for the groups, with no correlation with pain scores or morphine consumption. 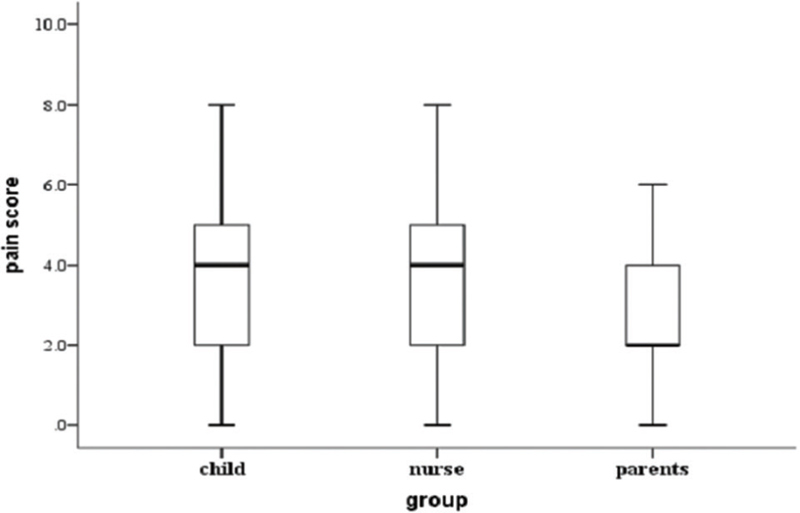 On day 1, there was a significant difference between the child and the parent group (P < 0.001), and between the nurse and the parent group (P < 0.001), whereas there was no significant difference between the child and the nurse group (P = 0.902) ([Table 4] and [Figure 1]). Figure 1: Median pain score in the three groups. On day 2, there was a significant difference between the nurse group and each of the child and the parent group (P < 0.001), whereas no significant difference was found between the child and the parent group (P = 0.013). On day 3 also there was a significant difference between the nurse group and each of the child group and the parent group (P < 0.001), whereas no significant difference was found between the child and the parent group (P = 0.470). Morphine consumption was higher with a significant difference on both days 2 and 3 in each of groups C and N compared with group P (P < 0.001), whereas no significant difference was found between groups C and N on all days ([Figure 2]). Figure 2: Mean morphine consumption (mg/day). *Significant difference from other two groups in the same day. On day 1, there was a significant difference between group P and each of groups C and N (P < 0.001), whereas no significant difference was found between group C and group N ([Figure 3]). Figure 3: Mean systolic blood pressure (mmHg). *Significant difference from other two groups in the same day. Mean systolic blood pressure (mmHg). *Significant difference from other two groups in the same day. On day 2, there was a significant difference between each of the three groups (P < 0.001). On day 3, there was a significant difference between group N and each of the other two groups (P < 0.001), whereas no significant difference was found between groups C and P. However, all these statistically significant differences in blood pressure were clinically insignificant as they were within the clinically accepted range and did not need interference. On day 1, mean heart rate showed a significant difference between group P and each of group C and group N (P < 0.001), whereas no significant difference was found between groups C and N ([Figure 4]). On each of days 2 and 3, there was a significant difference between each of the three groups (P < 0.001). Figure 4: Mean heart rate (HR) (beats/min). *Significant difference from other two groups in the same day. There was no significant difference between the three groups in oxygen saturation with no recorded respiratory depression. There were significant differences in respiratory rate between the child group and the other two groups on the three postoperative days (P < 0.001). There was also significant difference between the nurse and parent groups on the third day (P < 0.001). There was no significant difference within same group between the three postoperative days irrespective of group (P = 0.093) ([Table 5] and [Figure 5]). 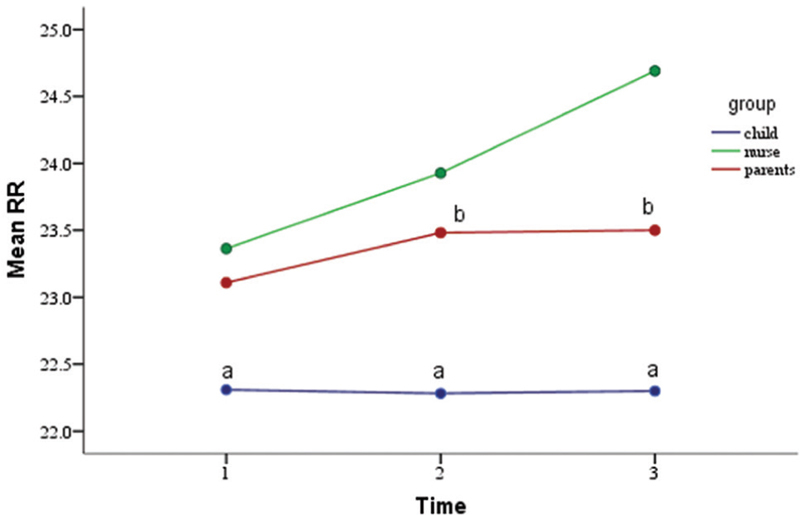 Figure 5: Mean respiratory rate (RR) changes in the three groups. *Significant difference from other two groups in the same day. However, these statistically significant differences in heart rate and respiratory rate were not clinically significant as they were within the clinically accepted range and did not need interference. There was no significant difference between groups in the number of PCA trials (both total and successful), but there was a significant difference between days, with fewer trials on the first day compared with the second day (P < 0.001) and fewer trials on the third day compared with second day, whereas no significant difference was found between the first and third days ([Table 6]). 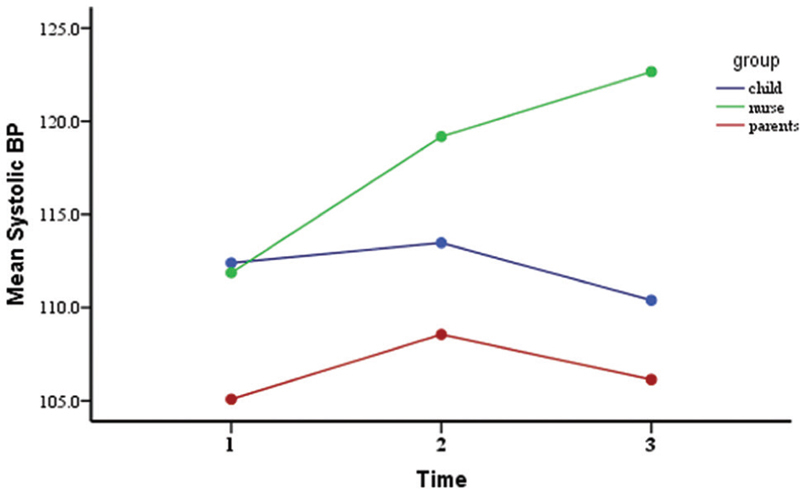 There were no significant differences in the sedation scale in each group within the 3 days, with P-value on days 1, 2, and 3 of 0.571, 0.241, and 0.173, respectively. There was no significant difference between groups ([Table 7]). As regards complications, there was no significant difference between the three groups over the three study days in vomiting rate, which was relatively low ([Table 8]). There were no reported cases of itching. Naloxone was not needed in the three groups; no oxygen therapy was needed; and there were no deaths from PCA complications in the entire study. PCA is an effective treatment option for reducing pain, but PCA errors can be quite serious . Opioid analgesics are among the most effective pain relievers available, but have adverse effects, including respiratory depression and other central nervous system effects . We used the FLACC behavioral scale for postoperative pain assessment of both preverbal and verbal preschool (1–6 years) pediatric patients. The FLACC was developed to provide a simple and consistent method to identify and evaluate pain in children who have difficulty verbalizing the presence or intensity of pain . The visual analogue scale was used for children who were 7 years or older as a quick, simple, sensitive, and reliable research tool . In terms of drug choice, we found that morphine is the most frequently used PCA opioid. In children, drug doses were calculated individually according to age and weight . Statistical analysis showed that the three groups were hemodynamically stable and there was no difference in the postoperative adverse events. The parent group showed least total postoperative morphine consumption, least pain scores in the three postoperative days, and best pain control in the age group 1–6 years as assessed using the FLACC scale. The child group showed best pain control in the age group 7–10 years and greatest total morphine consumption in all group, whereas the nurse group was the worst in pain control. Authorized agent-controlled analgesia (AACA) (proxy) provides same advantages of PCA for those who are unable to use PCA independently . Gureno and Reisinger had studied only eight pediatric surgical patients aged 3–5 years whose parent or nurse activated the PCA in cooperation with the patient. All patients achieved good pain control, with no respiratory depression. This coincides with our results of the parent control group with big difference in the number of studied patients . Monitto and colleagues studied the safety and efficacy of parent/nurse-controlled analgesia in patients less than 6 years of age. They concluded that both parent-controlled and nurse-controlled analgesia are safe and effective. These results are similar to ours with regard to the parent group, which we found to be safe and effective in pain control, but differs from ours with regard to the nurse group, which was safe but ineffective . In 2003, the Institute for Safe Medication Practices has issued precautions for PCA by proxy. They advised to establish protocols to identify suitable patients and to educate staff and family members. The Institute for Safe Medication Practices suggested that analgesia-related adverse events may be linked to insufficient patient monitoring . American Society for Pain Management Nursing supports the use of AACA to administer analgesia for patients who are unable to do so themselves . Similarly, Voepel-Lewis and colleagues conducted a retrospective chart review of 302 children, half of whom received PCA by nurse proxy. They reported a low occurrence of events requiring intervention in both AACA and PCA . Our study coincides with that of Cohen and Smetzer , who suggested that all patients less than 6 years of age receive PCA by proxy. We concluded from the results of previous studies and ours that the preferred age for child control is 6 years and that for parent control is less than 6 years. American Society for Pain Management Nursing has updated the guidelines and continues to support the use of AACA to provide timely and effective pain management . Howard and colleagues had studied nurse-controlled analgesia following major surgery in 10 000 patients between 1996 and 2008 with an average age of 4 years. 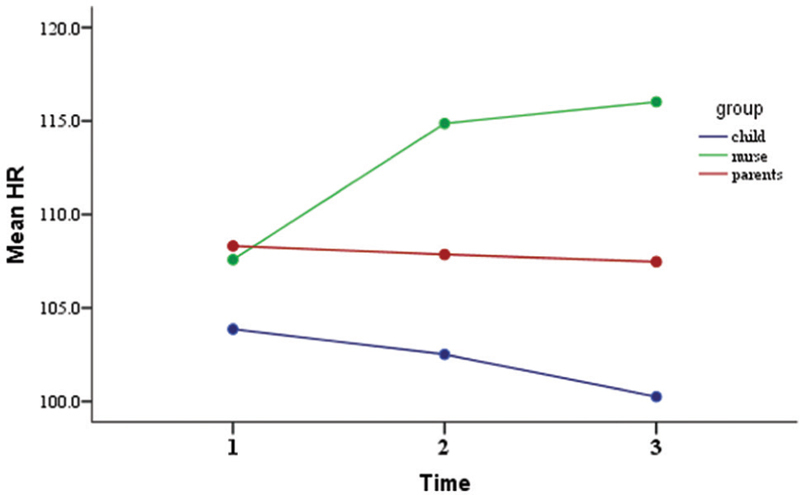 They concluded that nurse-controlled analgesia with morphine is an acceptable, safe, and effective method of postoperative analgesia for a wide range of ages and types of surgery . However, they considered only the nurse group without the parent or the child group; moreover, their results differ from ours with regard to pain control in the nurse group, which we found ineffective but safe. In our study we used background infusion for all patients to improve pain control and decrease the number of PCA demand doses . Our patients were rarely opioid naive, and their parents were well trained of their children's monitoring. This difference is likely to cause a greater safety of PCA by proxy at our institution, but this may limit generalization of our study. Studies suggest that morphine-induced sedation should not be considered as an indicator of a correct level of analgesia during intravenous morphine titration . Stopping morphine titration PCA when the sedation score is above 2 limits the risk for respiratory depression . There is no significant difference in vomiting in each group between three days (P = 0.12, 0.183, and 0.117, respectively). We attribute our low complication rates to several factors, including institutional standards and guidelines, caregiver education, the availability of nurses to make frequent bedside assessments, and careful patient monitoring. Parent-controlled PCA is safe for children between 1 and 6 years of age, nurse-controlled proxy is safe but not effective in controlling child pain, and child-controlled analgesia is safe and effective at age above 6 years. Verghese ST, Hannallah RS. Postoperative pain management in children. Anesthesiol Clin North Am 2005; 23:163-184. Berde CB, Sethna NF. Analgesics for the treatment of pain in children. N Engl J Med 2002; 347:1094-1103. Joint Commission on Accreditation on Healthcare Organizations (JCAHO). Sentinel event alert on patient controlled analgesia by proxy (2004); December 20, issue 33. Hudcova J, McNicol E, Quah C, et al. Patient controlled opioid analgesia versus conventional opioid analgesia for postoperative pain. Cochrane Database Syst Rev 2006; 18:CD003348. Cashman JN, Dolin SJ. Respiratory and haemodynamic effects of acute postoperative pain management: evidence from published data. Br J Anaesth 2004; 93:212-223. Cohen LL, Lemanek K, Blocent RL. Evidence-based assessment of pediatric pain. J Pediatr Psychol 2008;33(9):939-955. Jonas D. Parent's management of their child's pain in the home following day surgery. J Child Health Care 2003; 7:150-162. Malviya S, Voepel-Lewis T, Tait AR. A comparison of observational and objective measures to differentiate depth of sedation in children from birth to 18 years of age. Anesth Analg 2006; 102:389-394. Nelson KL, Yaster M, Kost-Byerly S, et al. Patient controlled analgesia by proxy: results from a national survey. Anesthesiology 2007; 107:A685. Voepel-Lewis T, Marinkovic A, Kostrzewa A, et al. The prevalence of and risk factors for adverse events in children receiving patient-controlled analgesia by proxy or patient-controlled analgesia after surgery. Anesth Analg 2008; 107:70-75. Overdyk FJ, Carter R, Maddox RR, et al. Continuous oximetry/capnometry monitoring reveals frequent desaturation and bradypnea during patientcontrolled analgesia. Anesth Analg 2007; 105:412-418. Babl FE, Crellin D, Cheng J. The use of the faces, legs, activity, cry and consolability scale to assess procedural pain and distress in young children. Pediatr Emerg Care. 2012; 28:1281-1296. Tomlinson D, von Baeyer CL, Stinson JN, et al. 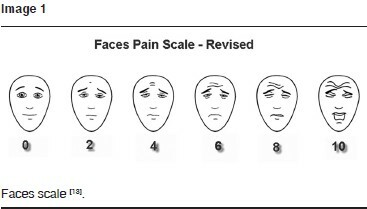 A systematic review of faces scales for the self-report of pain intensity in children. Pediatrics 2010; 126(5):e1168-98. R Srouji, S Ratnapalan, S Schneeweiss. Pain in children: assessment and nonpharmacological management. Int J Pediatr 2010;2010:474838. Malviya S, Voepel-Lewis T, Tait AR, et al. Effect of age and sedative agent on the accuracy of bispectral index in detecting depth of sedation in children. Pediatrics 2007; 120:461-470. Viscusi ER. Patient-controlled drug delivery for acute postoperative pain management: a review of current and emerging technologies. Reg Anesth Pain Med 2008; 33:146-158. Hicks RW, Sikirica V, Nelson W, et al. Medication errors involving patientcontrolled analgesia. Am J Health System Pharm 2008; 65:429-440. ST Verghese, Hannallah RS. Acute pain management in children. J Pain Res 2010; 3:105-123. Gureno MA, Reisinger CL. Patient controlled analgesia for the young pediatric patient. Pediatr Nurs 1991; 17:251-254. Monitto CL, Greenberg RS, Kost-Byerly S, et al. The safety and efficacy of parent/nurse-controlled analgesia in patients less than six years of age. Anesth Analg 2000; 91:573-579. Institute for Safe Medication Practices (ISMP). Safety issues with patient-controlled analgesia. Part I-how errors occur. ISMP Medication Safety Alert! 10 July 2003. Wuhrman E, Cooney MF, Dunwoody CJ, et al. Authorized and unauthorized 'PCA by proxy' dosing of analgesic infusion pumps: position statement with clinical practice recommendations. Pain Manag Nurs 2007; 8:4-11. Cohen MR, Smetzer J. Patient-controlled analgesia safety issues. J Pain Palliat Care Pharmacother 2005; 19:45-50. Cooney MF, Czarnecki M, Dunwoody C, et al. American Society for Pain Management Nursing position statement with clinical practice guidelines: authorized agent controlled analgesia. Pain Manag Nurs 2013; 14:176-181. Howard RF, Lloyd-Thomas A, Thomas M, et al. Nurse-controlled analgesia (NCA) following major surgery in 10,000 patients in a children's hospital. Paediatr Anaesth 2010; 20:126-134. Duedahl TH, Hansen EHA. Qualitative systematic review of morphine treatment in children with postoperative pain. Pediatr Anaesth 2007; 17:756-774.